The American Colonization Society was founded in Liberia 1816 by Robert Finley. Finley and Samuel John Mills organized the National Colonization Society of America and the American Colonization Society at Washington, D.C. in 1816 and 1817. The founding purpose of the societies was to assist freed Southern American slaves to emigrate to Liberia, in an effort to remove them from the United States. Beginning in the early nineteenth century, there was a gathering public opinion that freed slaves would be unable to assimilate into the predominantly white society of 1800 America. Freedmen often found that they were still treated as if they were slaves. Other freedmen felt adrift in America, lacking any real identity. Henry Clay, a senator from Kentucky and supporter of rights of free blacks, felt that because of "unconquerable prejudice resulting from their color, they never could amalgamate with the free whites of this country." The society held close control over the development of Liberia until 1847, when it was declared to be an independent republic. By 1867, the American Colonization Society helped more than 13,000 freedmen and former slaves emigrate to Liberia. The organization was formally dissolved in 1964. 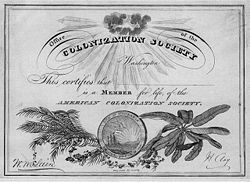 The American Colonization Society was established in 1816 by Rev. Robert Finley as an attempt to satisfy two groups in America. Ironically, these groups were on opposite ends of the spectrum involving slavery in the early 1800s. One group consisted of philanthropists, clergy and abolitionists who wanted to free African slaves and their descendants and provide them with the opportunity to return to Africa. The other group was the slave owners who feared the freedmen would disrupt their society and wanted to deport and expel them from America. On December 21, 1816, a group including Robert Finley, James Monroe, Bushrod Washington, Andrew Jackson, Francis Scott Key, and Daniel Webster met in Washington, D.C. with United States representative and speaker of the United States House of Representatives Henry Clay presiding over the meeting. They met again one week later and adopted a constitution. Finley suggested at the inaugural meeting of an African Society that a colony be established in Africa to take free people, most of whom had been born free, away from the United States. Finley meant to colonize "(with their consent) the free people of color residing in our country, in Africa, or such other place as Congress may deem most expedient." The organization established branches throughout the United States. It was instrumental in the establishment and founding the country of Liberia. During the next three years, the society raised money by selling membership. The Society's members relentlessly pressured Congress and the president for support. In 1819, they received $100,000 from Congress and in January 1820 the first ship, the Elizabeth, sent sail from New York headed for West Africa with three American Colonization Society agents and 88 emigrants. In addition to providing emigration passage for freedmen, the ACS purchased the freedom of American slaves and paid their passage to Liberia. For many years the ACS tried to persuade the United States Congress to appropriate funds to send colonists to Liberia. Although Henry Clay led the campaign, it failed. The society did, however, succeed in its appeals to some state legislatures. In 1850, Virginia set aside $30,000 annually for five years to aid and support emigration. In its Thirty-Fourth Annual Report, the society acclaimed the news as "a great Moral demonstration of the propriety and necessity of state action!" During the 1850s, the society also received several thousand dollars from the New Jersey, Pennsylvania, Missouri, and Maryland legislatures. The ACS maintained control over the colony of Liberia until 1847 when, under the perception that the Great Britain might annex the settlement, Liberia was proclaimed a free and independent state. Through the members of the ACS, the country was provided with a constitution that was fashioned after the American model. By 1867 the ACS had sent more than 13,000 emigrants. After the American Civil War, when many emancipated slaves wanted to go to Liberia, financial support for colonization waned. During its later years the society focused on educational and missionary efforts in Liberia rather than further emigration. The ship arrived first at Freetown, Sierra Leone then sailed south to what is now the Northern coast of Liberia and made an effort to establish a settlement. All three ACS agents and 22 of the emigrants died within three weeks from yellow fever. The remainders returned to Sierra Leone and waited for another ship. The Nautilus sailed twice in 1821 and established a settlement at Mesurado Bay on an island they named Perseverance. The native Africans resisted the expansion of the settlers resulting in many armed conflicts. Nevertheless, in the next decade 2,638 former slaves migrated to the area. Also, the colony entered an agreement with the U.S. Government to accept freed slaves captured from slave ships interdicted en route to and in American waters. During the next 20 years the colony continued to grow and establish economic stability. Since the establishment of the colony, the ACS employed white agents to govern the colony. 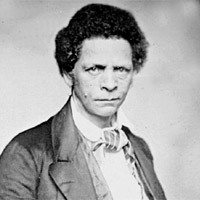 In 1842 Joseph Jenkins Roberts became the first non-white governor of Liberia. On July 26, 1847, the legislature of Liberia declared itself an independent state, with Roberts elected as its first president. The Americo-Liberian settlers declared the independence of the Republic of Liberia. The settlers regarded Africa as a "Promised Land," but they did not integrate into an African society. Once in Africa, they referred to themselves as "Americans" and were recognized as such by local Africans and by British colonial authorities in neighboring Sierra Leone. The society in Liberia developed into three segments: The settlers with European-African lineage; freed slaves from slave ships and the West Indies; and indigenous native people. These groups would have a profound affect on the history of Liberia. Beginning in the 1830s, the society was harshly attacked by some abolitionists, who tried to discredit colonization as a slaveholders' scheme and the American Colonization Society as merely propaganda for the continuation of slavery in the United States. Most of the presidents of the ACS tended toward Southerners. The first president of the ACS was the nephew of former President George Washington, Bushrod Washington. Senator Henry Clay of Kentucky was ACS president from 1836 to 1849. In March 1825, the ACS began a quarterly, The African Repository and Colonial Journal, edited by Rev. Ralph Randolph Gurley, who headed the society until 1844. Conceived as the society's propaganda organ, the Repository promoted both colonization and Liberia. Among the items printed were articles about Africa, letters of praise, official dispatches stressing the prosperity and steady growth of the colony, information about emigrants, and lists of donors. The aims of the society were various. It was supported not only by those who were abolitionists on moral grounds, but also by Southerners fearful of organized revolt by free blacks, and by Northerners concerned that an influx of black workers would hurt the economic opportunities. As a former Whig and an admirer of Henry Clay, Abraham Lincoln supported the Society throughout the 1850s. Early in his presidency, Lincoln tried repeatedly to arrange resettlements of the kind the ACS supported, but each arrangement failed. By 1863, some believe that Lincoln abandoned the idea following the use of black troops. Lincoln biographer Stephen B. Oates observed that Lincoln thought it immoral to ask black soldiers to fight for the United States and then remove them to Africa after their military service. While others like Michael Lind believe that as late 1864 or 1865 Lincoln continued to hold out hope for colonization, noting that he asked attorney general Edward Bates if the Rev. James Mitchell could stay on as "your assistant or aid in the matter of executing the several acts of Congress relating to the emigration or colonizing of the freed Blacks." General Benjamin F. Butler claimed that only two weeks before he died, Lincoln had asked him to investigate the possibility of colonizing colored troops to Panama in order to build a canal because Lincoln feared that they might initiate a "race war" after the Civil War ended. Three of the reasons the movement never became very successful were the objections raised by blacks and abolitionists, the enormous scale of the task of moving so many people (there were four million free blacks in the U.S. after the Civil War), and the difficulty in finding locations willing to accept large numbers of black newcomers. Lemuel Haynes, a free black Presbyterian minister at the time of the society's formation, argued passionately that God's providential plan would eventually defeat slavery and lead to the harmonious integration of the races as equals. In 1913 and again at its formal dissolution in 1964, the society donated its records to the U.S. Library of Congress. The material contains a wealth of information about the foundation of the society, its role in establishing Liberia, efforts to manage and defend the colony, fund-raising, recruitment of settlers, conditions for black citizens of the American South, and the way in which black settlers built and led the new nation. Colonization: The African-American Mosaic. U.S. Library of Congress. “The Great Emancipator Abraham Lincoln and the Issue of Race” by Robert Morgan. Journal of Historical Review. Institute for Historical Review. American Colonization Society – Slavery in the North by Douglas Harper. History of "American Colonization Society"
This page was last modified on 17 March 2019, at 16:07.